KC: If I recall correctly, I think you told me you served three different tours in the Air Force in Korea? JS: Correct, I was stationed at Kunsan Air Base in 2003-2004, 2009-2010 and Osan Air Base 2016-2017. KC: When did you get into collecting autographs and memorabilia? JS: The earliest I can remember getting autographs was when I was about five or six years old. Where I grew up in Maryland we had a minor league baseball team, the Hagerstown Suns, so I would go there quite often since it was such a small town with not much to do. As I've gotten older, my collecting tastes have changed and I've started to collect more game used/team issued items. KC: Ok, so you've served three tours in Korea. What did you think of the country and did you get a different taste of the country with each visit? JS: Each tour was totally different than the other, but the one constant was that I always loved Korea. During my first visit I never knew that the KBO existed. I had gotten autographs from Korean players Song Seung-Jun, Bong Jung-Keun & Jae Seo in America while they were playing minor league baseball but I never thought about whether there was an actual league in Korea. During my first tour I was able to go on a trip to a Kia Tigers game that the air base hosted. During my second trip I was able to go to another Kia Tigers game and during my 3rd tour it was pretty much "game on" for me when it came to the KBO. Every time that I've been stationed in Korea I've been amazed at how quickly the country has grown. KC: What did you like the most about Korea? And the least? JS: It's hard to narrow it to one thing that I liked the most about Korea. The accessibility to the KBO players and their generosity was definitely awesome! I love how easy & affordable it is to travel around the country. All the sporting events are super affordable as well so that was a plus for me. I'm a huge fan of the food and being able to take whatever you want into games. I'd love to be able to take my kids back one day and introduce them to all the amazing people that I met during my time in Korea. The thing that I disliked the most was probably how crowded the subway & buses would be, I'm pretty tall compared to Koreans so public transportation could be uncomfortable for me at times. KC: What made you become a KT Wiz fan? JS: The way that I became a Wiz fan is kinda funny. Going over there I didn't really have a KBO team, but being from Maryland, I am a huge Orioles fan and at that time Kim Hyun-Soo was with the Orioles so I figured that I would cheer for his old team, the Doosan Bears. I had gone to Jamsil to see the Bears play and I figured that I would be able to get a Kim Hyun-Soo jersey in my size, but the Bears didn't makes jerseys in my size so that pretty much ended my rooting interest in the Bears. With the Wiz playing in Suwon and being so close to the air base, I ended up going to Suwon the most out of all the stadiums so that pretty much cemented the Wiz as my team. Plus they actually had jerseys that would fit me and I could wear so that was icing on the cake for me. KC: Lee Dae-hyung is easily the most popular KT Wiz player. What made him your favorite player? JS: Picking Lee Dae-Hyung as my favorite player is actually a funny story too. I went to the Wiz team store during my first game in Suwon and I found the only Korean working in the team store that could speak English. I asked her about jerseys and she suggested an Andy Marte jersey, I assume it's because Andy and I were both foreigners, but I wanted a jersey of an actual Korean player. I asked the lady working there who she would suggest and she told me Lee Dae-Hyung, she told me that he was very popular and handsome, lol. So I buy the jersey and I'm wearing it around before the game started and I have no idea who Lee Dae-Hyung actually is so when the lineups are being announced and I see this guy run out onto the field with a shiny metallic gold glove and cleats I thought to myself, well he's certainly confident lol. I remember that he started off the season pretty slow as far as his hitting was concerned and my friends would give me a hard time about wearing his jersey since he was in a slump. As I watched Lee Dae-Hyung play more and more, I really began to appreciate the way he played the game, you don't see very many players like that in MLB and the rest as they say is history. Justin getting an autograph from a SK Wyverns player. KC: Based on what you own and have seen, what do you like and dislike about baseball cards in Korea? JS: I would have to say that the part I liked most about Korean baseball cards was the rounded corners. I know that it may sound silly that that was my favorite thing but rounded corners made it a lot easier to keep the cards in mint condition if you wanted to get them graded or anything like that. Another thing that I liked was that the designs of the cards were different, I think that the Black Edition design was 100 times better than this years Topps design. There were a few things that I didn't like about the card releases though, the prices of the relic, autograph & insert cards on the secondary market was outrageous. I found it hard to spend 10,000 won on a certified autograph of a guy that had less than 50 at bats in the KBO. Another thing that I didn't like was how hard it was to actually find cards in stores. Unless you could find a brick & mortar store like we did or order them on line, you were pretty much outta luck. The last thing that I disliked was that it seemed like the player variety got a lot smaller in the newer releases. I would like to have seen more rookies like they did in the 2015 Super Star Season 1 release, those cards were pretty cool, especially the ones in the college uniforms. KC: Which Korean set is your favorite and why? JS: I'm not sure if you would consider this a set but the 2014 Cass Point release is my absolute favorite, the design is awesome and it reminds me a lot of the newer Diamond King releases in the states. I'm also a fan of the 2014 Season 2 & 3 All Star subsets as well. I like to get my cards signed and the autographs really pop on those cards. If I had to pick a favorite set, I would have to say that the Black Edition was my favorite set although I wasn't a big fan of the All Star subset. 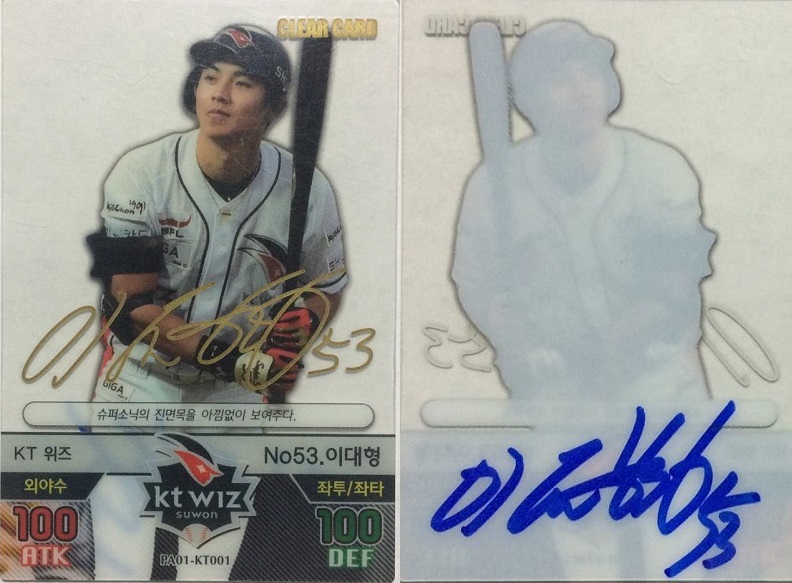 KC: Do you have a single favorite Korean baseball card? If not one, name a few. JS: I would have to say that my favorite card is the Lee Dae-hyung Baseball's Best Players Hell's Fireball clear card, that was the first card that I was able to get Super Sonic to sign for me. KC: Do you have any interesting stories about getting autographs from a player (regardless of league)? JS: Even when I was in America, I was a fan of foreign players and would intentionally collect foreign players cards. Naturally I had a lot of MLB cards of Song Seung-Jun, Bong Jung-Keun, Choi Hee-Seop, Seo Jae-Weong, Ryu Jae-Kuk and those were the guys that I really wanted to meet when I got to Korea. The first player on that list that I met was Ryu Jae-Kuk and I greeted him in Korean and he replied " Hey what's up" and I was just taken back a little cause I wasn't expecting his English to be that perfect. I ran into him a lot during the season and I also ran into him a couple times at SK Knights basketball games and he always took the time to talk to me which I really appreciated. I became a pretty big fan of his and actually bought an LG Twins jersey with his name on it and had him sign it for me. The second guy from the list that I met was Bong Jung-Keun, I asked him for an autograph and without missing a beat he asks me in perfect English if I want the cards signed in Korean or English which I thought was pretty cool. I had so many of his cards and I felt bad constantly asking him to sign for me. I was never actually able to get his autograph while he was in America so I had about 10 years worth of cards to get signed and that wasn't even counting his KBO cards. I have a pretty funny Hee Seop-Choi story, this was during the Seoul round of the WBC. 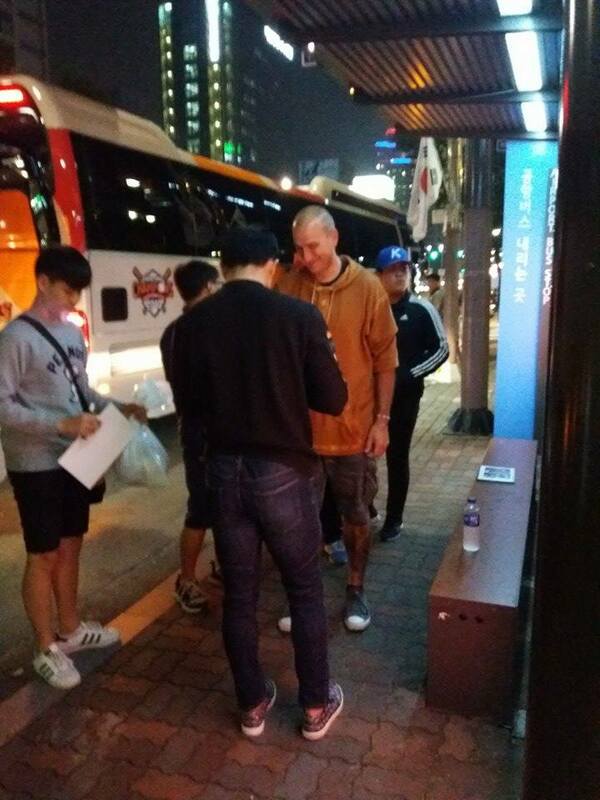 Me and a couple of my Korean friends were trying to get autographs from the Netherlands, Israel & Chinese Taipei teams. So we were at the Express Bus Terminal and we seen this guy that looked like Hee Seop-Choi sitting on a bench waiting for a bus, we started walking around to see if it was really him and sure enough it was. Of course I had a stack of his cards with me cause it got to the point where I carried all my cards with me because I never knew who I was going to run into. I walked over to Hee Seop with my Korean friend and Hee Seop signed his KBO cards in Korean and his MLB cards in English. I do have a pretty good Lee Dae-Hyung story, KT was playing either Doosan or LG at Jamsil, I can't remember which team it was. This game was on my birthday so I decided to spend the night in Seoul and I just so happened to be staying in the same hotel as the Wiz. I'm outside the hotel & the Wiz bus pulled up outside and I was trying to get some cards signed. I wasn't expecting to get Lee Dae-Hyungs autograph because he's a pretty tough signature to get due to his popularity. I'm standing outside and I feel someone tapping on my shoulder, I turned around & it was Lee Dae-Hyung, he says to me "Do you want my autograph?" I had a belly full of Hite so I was feeling pretty good and my response was an emphatic hell yeah! That was a pretty memorable birthday for me in Korea to say the least. KC: I know your card collecting interest is wide-ranging. Do you prefer collecting MLB or other leagues? JS: I would have to say that it's 50/50 when it comes to my collecting. I enjoy collecting minor league baseball cards in the States because I like to get the cards signed and it's usually easier to get a minor league card signed. I enjoy collecting NPB & CPBL cards because the designs are so different than what I'm used to seeing. The foreign leagues also include American players in their sets which the KBO doesn't anymore. Another plus with collecting foreign baseball cards is that when I get those cards signed, the players are really surprised to see them and a lot of times the player didn't even know that they existed. KC: What would you tell those who have not explored cards outside of the US brands/MLB? JS: My best advice would be to do your research for whatever cards you're trying to buy. I can't count how many hours I spent researching whether the KBO had cards or where I could buy them at. I would also say go to the ballpark and talk to people, most of the time you'll be able to find someone who knows if that league produces baseball cards. KC: Finally, could you tell us how your KT video, and Suwon fame, came to be? JS: I would have to say that my fame came about due to my passion for autographs. As you know and can attest to, the only people trying to get autographs as the players show up to the stadium are either, Korean women, Korean children or older Korean men, the players and the Koreans aren't used to seeing a six foot American with a stack of Korean baseball cards so you could say that I stood out. My first couple of games at Wiz Park, I would sit in the outfield because they were the cheapest tickets and they were easiest for me to buy. I had seen the cheering sections but and I always wanted to sit there but I was timid at first because I didn't want to make a fool out of myself. After a couple games I finally got the courage to sit in the cheering section and participate in the cheers. Most of the time when you go to a KBO game, you'll see foreigners at the game, but I actually knew all the dance moves & the words to the cheers even though I didn't know what all the words meant. One day I was on the myKBO.net Facebook page and I seen a post from the Wiz website on there that had my picture on it saying that they wanted to meet me. I got in contact with the Wiz and they told me that they wanted to interview me and film it, I didn't know it at the time , but I was the Wiz' first foreign super fan. After the video was made I figured that the video would be posted on the Wiz' website, I didn't realize that they showed it before every home game on the scoreboard until I was actually in the stadium early enough to see it. To say that seeing myself on the scoreboard was surreal would be an understatement. I'd like to thank Justin for taking the time to complete this interview. Don't forget to check out his Charm City Autographs Facebook page. Are there many American KBO fans and/or card collectors? Thanks for sharing the interview! There are many foreign KBO fans from Western countries. As for collectors, I only know a handful of foreign Korean card collectors.